Have you ever wanted to start dinner only to find that the pot or pan you need is currently behind the others? While this can definitely put a damper on how excited your family is for dinner, this small factor can make your kitchen one of the most despised rooms in the home. If you are tired of searching your kitchen cabinets for extended periods of time, try these 3 ways to declutter and organize your kitchen. If you have an older home, there likely wasn’t much thought put into the amount of space needed for storage in your kitchen. This can simply be attributed to the increase in kitchen gadgets now available and the affordability of pots and pans that can quickly clutter your space. As a Waypoint Living Spaces® Cabinets dealer, we have access to a wide variety of cabinet materials, hardware and organization solutions to help you declutter and organize your kitchen. Have you ever bought a new item for your kitchen just to test a recipe and then found you had no use for the item anymore? If you have, what are the chances you actually need that item or that you will ever use it again? 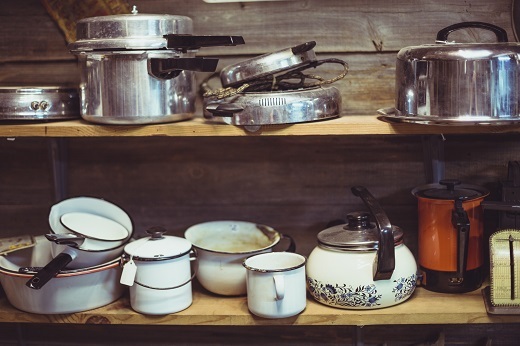 If possible, take an inventory of your current kitchen items and consider selling or donating them if they are no longer needed. If you are like most homeowners, you probably a select few of your pots and pans more frequently than others. In this scenario, try to make sure you are storing these items as close to the front as possible if you have deep cabinets. This will decrease the amount of time you have to spend pulling pots and pans out to get the one you need and then storing them all over. Ready to declutter and organize your kitchen? If you are in need of a new look for your kitchen or bathroom, TimCo Construction would love to explain our excellent remodeling options in greater detail. To find out more about our remodeling options, contact us, or give us a call at 918-779-7330. Previous Previous post: What Are Your Kitchen Needs?